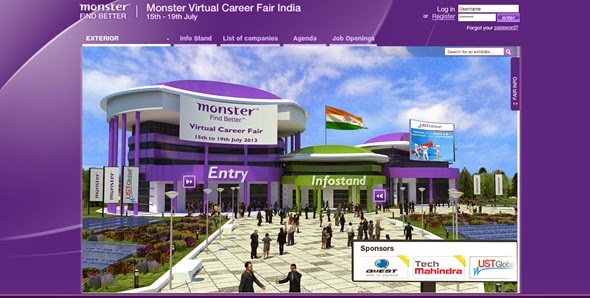 MonsterIndia.com is hosting a 5 day Virtual Career Fair that started today. Central to the website is a flash application that takes visitors through a virtual tour of locations that attempt to look like a real-world job fair including a Reception area, Show Floor, Press and Video Zones. The Info Stand provides access to visitor profiles & mailbox including tools to submit CVs and chat online if you are logged-in. The Video Zone has a lounge-like setting that plays a single video – there is no other multimedia content available as of now. Jobs from a host of companies are available and online chats have been scheduled every day for applicants to get their queries answered. Simple navigation is also available for visitors who want to get on with applying for specific jobs. The flash application has been built out in great detail and a lot of effort has gone into designing and creating the zones and showcase areas for each of the ‘exhibitors’ with customized content including videos, banners, employee testimonials and other information. The transitions with zooming animations are also nice. 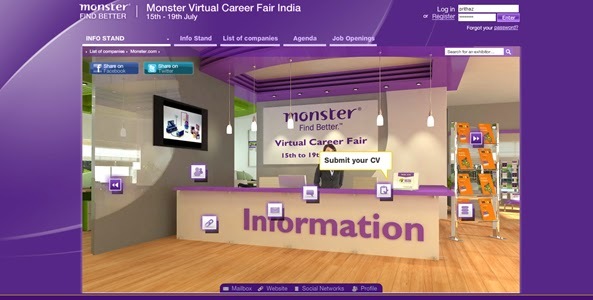 This is a fantastic attempt to infuse some excitement around new jobs available on Monster India. I do have a couple of small issues if I get down to nit-picking. In the introductory sections, if we leave out the job postings, the content seems bare bones. If the idea was to engage the visitor, the content could have been beefed up with articles, tips, deeper video zone perhaps. I am sure this sort of content already exists somewhere on Monster and could have been used here. Also the icons and blurbs in the design could have done with a slick treatment. They just don’t gel with the rest of the design. But this is a super execution, nonetheless. What do you think? Nice site monster India. I like!